The 14.1in device is 0.3mm thick and can show 4,096 colours, which – although nothing like as vivid as a normal LCD display – represents a major breakthrough in e-paper technology. The previous-generation of A4 e-paper was a monochrome sheet unveiled just twelve months ago. 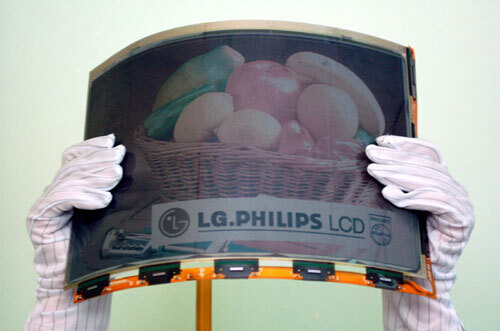 Prior to that, LG Philips developed the world’s first flexible monochrome display, a 10.1in device, in October 2005. A metal foil substrate replaces the glass usually found in LCDs, allowing the new display to be bent and to recover its shape afterwards. Naturally, a viewing angle of 180 degrees is necessary for the e-paper to remain visible whatever shape it is molded into. On the environmental front, the device uses electronic ‘ink’ from E Ink, which means it consumes power only when the on-screen image changes. Other product information, such as refresh speed and likely pricing, were not given. Those applications are likely to begin with advertising using the new e-paper on non-flat surfaces, such as street furniture and various kinds of in-store display. As a result, analysts expect the flexible display market to be worth around $12 billion by 2015.